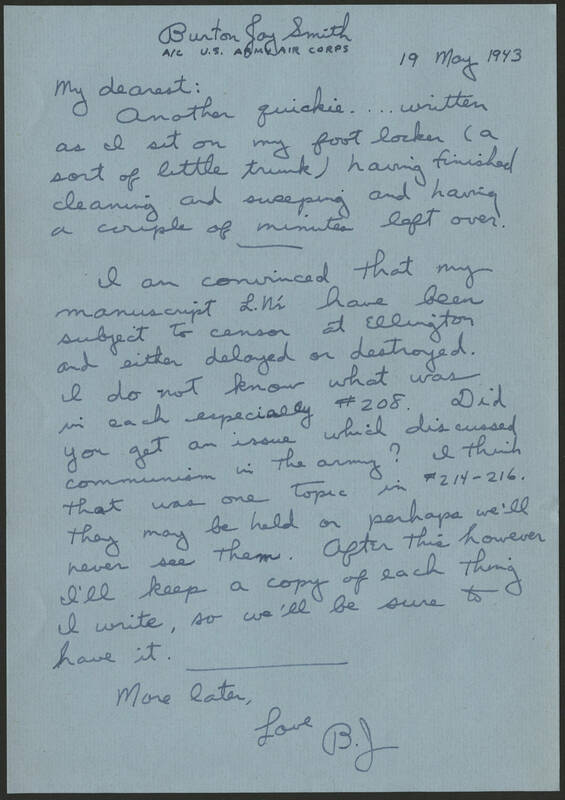 19 May 1943 My dearest: Another quickie... written as I sit on my foot locker (a sort of little trunk) having finished cleaning and sweeping and having a couple of minutes left over. I am convinced that my manuscript L.N. 's have been subject to censor at Ellington and either delayed or destroyed. I do not know what was in each especially #208. Did you get an issue which discussed communism in the army? I think that was one topic in #214 - 216. They may be held or perhaps we'll never see them. After this however I'll keep a copy of each thing I write, so we'll be sure to have it. More later, Love B.J.